Treat yourself to real wood-smoked BBQ and brisket, a mess of classic southern sides, and a friendly family environment with a visit to Southport Smoke House. 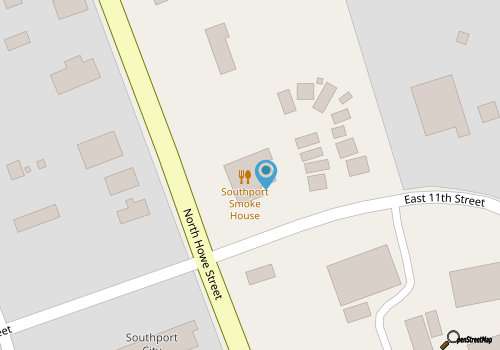 Located on the outskirts of Howe Street on the edge of the Historic Southport Downtown area, and featuring big meaty southern plates that run out when the crowds are thick, Southport Smoke House is a popular spot for visitors and locals alike to dive into North Carolina barbecue staples at their down-home best. The menu is fairly basic, and revolves around popular southern staples, in plate or sandwich form. Menu mainstays include BBQ, brisket, sausage, ribs, and smoked chicken, or a combination of two or three proteins. (Many of these menu items are also available by the pound.) To round out a hearty meal, patrons can opt for one of the Southport Smoke House’s many sides, which include both red and white slaw, baked beans, green beans, potato salad, seasoned fries, mac and cheese, and even slightly spicy Buffalo Chips. Cap off a big meal with a helping of banana pudding and a glass of sweet tea, and enjoy a decadent but inherently southern meal that will satisfy the largest of Southport appetites. Call (910) 363-5035 for current hours.